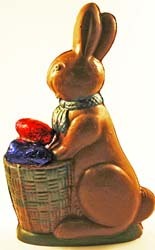 This Bunny is on the Way to Your House Loaded with Goodies! Semi Solid Swiss chocolate hand-painted at Dorothy's Candies. From Anonymous of McKeesport, Pennsylvania on 4/20/2014 . From Rose Lloyd of Puyallup, Washington on 4/8/2013 .